A PDF version of this article appears in the October 28, 2016 issue of Executive Intelligence Review. The keynote address of Helga Zepp-LaRouche to the Schiller Institute conference in Essen, Germany on Oct. 21, 2016. Helga Zepp-LaRouche is the Founder of the international Schiller Institutes and chair of the Schiller Institute in Germany, and chair of the German political party Civil Rights Movement Solidarity (BüSo). Dear ladies and gentlemen, honored guests, most honored chargé d’affaires [of the Embassy of China in Berlin]: I am very happy that this event has begun with this wonderful performance of Chinese art, because I believe that art is the best way to open the hearts of mankind to new ideas. We are hosting this conference in Essen—and a similar conference took place just two days ago in Lyon, France, in cooperation with the China Club EM Lyon Forever1—because we intend to put on the agenda a new perspective for Europe, namely cooperation between Germany and France on the New Silk Road. By organizing many such conferences, we want to make much better known the political, economic, and cultural potential which exists in the New Silk Road policy. Because the New Silk Road, which is already developing effectively at a very rapid tempo, is fast becoming a project of understanding among nations and is developing into the World Land-Bridge. Obviously the New Silk Road provides enormous potential for business “opportunities,” that is, business relations, but actually it involves something much more important. It involves not only linking together the world’s continents through infrastructure and development corridors, and making innovation the science driver for the world economy with the goal of raising productivity. It involves something very much deeper and more fundamental than that: Can mankind, in the face of all the crises which we see before our eyes, establish a world system in which people can live together in peace? Is humanity capable of defining a higher level of reason, or are we compelled—by keeping to the well-worn paths—to hit a stone wall, perhaps losing civilization forever? I believe that it is possible to find this higher level of reason, and to make it effective. Just as the ancient Silk Road, during the Han Dynasty some 2,000 years ago, was not only a means for the exchange of goods, but also of technology, culture, and philosophy—and thus led to an enormous improvement in the living standards of all the participating nations and regions—so, I believe, it is possible to put on the agenda today a New Silk Road, a new policy for binding nations together. But I can not talk about the advantages of this new paradigm without at least very briefly identifying the great dangers which the world is confronting at this moment, and why, in my opinion, the New Silk Road is not an option, but a necessity, if we are to avoid a catastrophe. 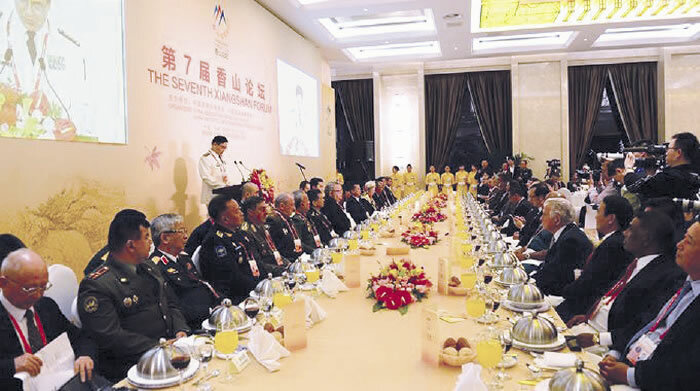 The Seventh Xiangshan Forum, in Beijing Oct. 11-12, convened more than 500 delegates from law enforcement agencies and institutions, and representatives from the expert community from almost 60 countries. And Russian and Chinese military officials at the Seventh Xiangshan Forum in Beijing a week ago warned that the Obama Administration has gone a long way in preparation for a first strike against their two countries on the basis of the Prompt Global Strike doctrine! Nor can anyone claim that Europe doesn’t face other crises. After the Brexit, the future of the European Union (EU) is somewhat unclear. The refugee crisis has shaken Europe’s very foundations, and esteem for the EU handling of this crisis has absolutely collapsed internationally, as I myself have had to recognize many times. We are approaching a new financial crisis like that of 2008, only this time potentially very much worse, of which Deutsche Bank’s crisis is only the tip of the iceberg. And everyone knows that if Deutsche Bank, with its 42 trillion euros of outstanding derivatives goes bankrupt, then all the banks which are allegedly “too big to fail,” would be immediately affected. And as a former member of the board of a large European bank told me a few days ago: If the storm breaks out and the governments do nothing to bring matters under control, then the biggest losers will be those who have earned their life savings with honest work. We will have a different kind of Europe, full of ungovernability—and chaos and revolution will be at hand. I point to that as a scenario simply because, if we do not change course, the danger is that we will enter an unprecedented crisis. Now the good news is that, because all these crises are man made, if we change our policies, we can overcome them. Western media have scarcely reported what a dramatic change has occurred over the past three years, since President Xi Jinping put the New Silk Road on the agenda. A totally new perspective has emerged, which has developed with enormous momentum and in which more than 70 nations are already cooperating. 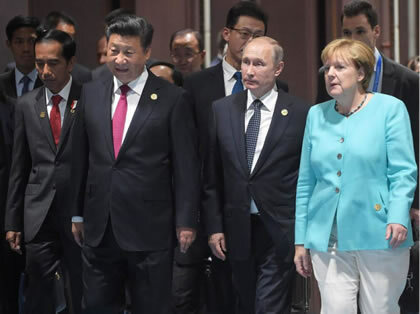 Indonesian President Joko Widodo, Chinese President Xi Jinping, Russian President Vladimir Putin, and German Chancellor Angela Merkel arrive for the opening ceremony of the G20 Summit in Hangzhou, China. Since the economic reforms of Deng Xiaoping, China itself—as most of you know, either through visits there or reports—has carried out an unbelievable transformation from total underdevelopment to at least partial industrialization. Interestingly, the Chinese economic miracle proceeded according to the same principles as the German Economic Miracle of reconstruction after World War II, namely the principles which were then applied by the Kreditanstalt für Wiederaufbau, and which were close to the ideas of the German economist Friedrich List, who, interestingly, is the best known and most loved German economist in China. Over a span of 40 years, China has been able to accomplish the development that took the industrialized nations up to 200 years. China has long since stopped relying on cheap production, but is already the world market leader in many areas such as high-speed rail. By the end of 2015, China had built 20,000 kilometers of high-speed rail. It will have 38,000 kilometers of high-speed rail by 2025, linking all major cities in this way. It has surpassed many western nations in the digitalization of industry and is the market leader in many areas. Over this period of 40 years, China has freed 700 million people from poverty. I believe there is no country that has done as much for human rights as China, because poverty is the greatest violation of human rights; therefore to have done what China has done is a great contribution to human civilization. China has even published a white paper on overcoming extreme poverty entirely by 2020; only three percent of the population still lives in extreme poverty, and China is determined to change that. At the recent G-20 summit in Hangzhou, hosted by China, China announced its proposal to base the world economy on innovation and win-win cooperation, and declared China’s intention to become an innovative nation by 2020—in my view it already is one—an internationally leading innovative nation by 2030, and a “world powerhouse” by 2050. China declared that innovation is the primary driving force of an economy, and that it is determined to escalate the benefits of scientific and technological progress in all areas—modern agriculture, information technology, protection of the environment, the ocean and space industries, and healthcare and services. President Xi Jinping has given Chinese scientists the mission to achieve fundamental breakthroughs in four specific domains: the structure of matter, the evolution of the universe, the origin of life, and the nature of conciousness. It perhaps will surprise some, but Chinese economic theories are very close to what we call physical economy as it was developed by Wilhelm von Leibniz, and taken further by Friedrich List; Mathew Carey; Henry C. Carey, Abraham Lincoln’s economic adviser; and Wilhelm von Kardorff, Bismarck’s chief economic adviser, and to whom we owe Bismarck’s shift from supporting the free trade outlook to advocating of physical economics, and Germany was enabled to become an industrial nation. According to the theory of physical economy—which has been further developed by Lyndon LaRouche, my husband, whom we have here with us—the source of society’s wealth does not lie in the control of trade relations (for example, a TPP or TTIP), or in “buying cheap, selling dear,” or in the control of raw materials, and certainly not in the derivatives trade and other speculative “products.” Society’s wealth lies ultimately in the creative potential of the human spirit and the application of scientific and technological progress to the production process, which raises productivity, and thus is the source of the improvement of living standards and life expectancy. China has developed, along with the nations along the Silk Road, a comprehensive plan for scientific and technological cooperation, and will establish joint research laboratories and centers, and organize technology transfer and the exchange of 150,000 scientific personnel and 5,000 young scientists. The goal is explicitly to raise the productivity in the cooperating countries. At the G-20 Summit, President Xi Jinping announced that China will share breakthroughs in scientific and technological progress immediately with the developing countries, so that their development is not delayed. This ideal, to my knowledge, was first proposed in the 15th Century by Cardinal Nicholas of Cusa, who likewise said that human inventions are so important for the human race that they should immediately be placed in an international pool in which all can participate, so that their development will not be held back. China’s Silk Road conception is the greatest infrastructure and industrialization program that has ever existed on Earth. Already there are 30 treaties between China and other nations; 70 nations are cooperating, involving 4.4 billion people altogether. The total investment amounts to $1.4 trillion, which is twelve times greater than the Marshall Plan after the Second World War, measured in today’s purchasing power. The Silk Road is a perspective for the economic transformation of the Earth over the next 30 to 40 years, and by no means involves only trade routes to Europe and Africa. The expression “Silk Road” was coined by the German geologist Ferdinand von Richthofen in 1877, but “Silk Road” is actually a synonym for the integration of regions and routes for the exchange of science and technology, and what the Silk Road technology was then—how to produce silk, how to produce porcelain—is today the most modern technologies, like the question of nuclear fusion, or space technology. It’s obvious that Germany’s future lies in cooperation with this project, because Germany has something which is highly valued in the whole world, and that is the German Mittelstand (small and medium-sized enterprises), which in fact contributes the most to innovation. Germany, which as you know, has hardly any raw materials, was only able to achieve high productivity and a high living standard because we always had a very high rate of scientific and technological progress, and a very high rate of exports. In Germany it is the Mittelstand that is the source of most inventions and patents, that provides 85% of expenditures for the general welfare, and it is the German Mittelstand which would profit the most from cooperation with China—not only through direct German investments in China and Chinese direct investments in Germany, but primarily through joint ventures in various projects in third countries. 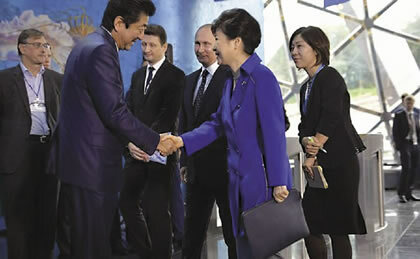 Russia President Vladimir Putin looks on as Japanese Prime Minister Shinzo Abe and President of the Republic of Korea Park Geun-hye greet each at the Vladivostok Eastern Economic Forum plenary session. Over the last six weeks the process of change has reached an enormous rate of speed, and there is now a totally new alignment. At the beginning of September, there was an economic forum in Vladivostok, where China’s New Silk Road was integrated with the Eurasian Economic Union under the leadership of Russia. Prime Minister Shinto Abe of Japan was there, as well as South Korea’s President Park, both with large economic delegations. Immediately after that, there was the G-20 Summit in Hangzhou, at which China presented a new model for economic relations among nations, focussing on the United Nations Charter, with its emphasis on sovereignty and respect for different economic and social models. President Xi said on this occasion that the old model is no longer sustainable; we now need an innovation-directed strategy. We will take the lead in science and technology, and conduct the fundamental research needed to solve the scientific and technological problems holding back economic and industrial development. We will speed up the commercialization of research and development, foster strategic emerging sectors, and move industry up to a medium-high level of the value-added chain. This philosophy was then discussed further at the directly following summit of the ASEAN nations in Laos, a summit which actually consummated a strategic orientation toward China and, for example, adopted the Chinese position on the conflict in the South China Sea. Their final declaration stated that China’s development was an opportunity for the entire region. Philippine President Rodrigo Duterte, during his visit to China, has just said that he will now prioritize the relationship with China. The same interests were stressed at the immediately following conference in Goa, India of the BRICS nations—which are at the core of Eurasian integration—and remaining tensions were downplayed. The reason is clear: The Asian dynamic continues to grow. The first train carrying containers departs the logistics terminal jointly built by China and Kazakstan in Lianyungang City, in China’s Jiangsu Province, Feb. 25, 2015. The tempo of this strategic realignment shows very clearly that the center of world politics has shifted to Asia. 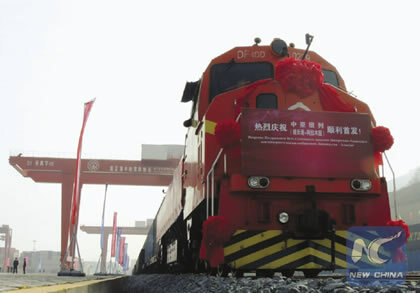 When the first train arrived from China five years ago, it created great surprise. But now, 20 trains a week are coming from different economic regions—Zhenjiang, Lianyungang, Harbin, Yiwu, Wuhan, Chengdu, Chongqing—to Duisburg, Hamburg, Rotterdam, Lyon, and Madrid. The Eastern and Central European countries have long since realized the advantages of working with China, because China has invested in the transport corridors that were agreed on in 1994 at the EU Conference in Crete but never realized, because of the Troika’s austerity policy. China has expanded the port of Piraeus, or is soon to expand it; it is building the railroad line from Greece to Serbia, towards Hungary; it is connecting the Oder-Elbe-Danube Canal with the other European waterways. The governments of Greece, Serbia, Hungary, the Czech Republic, Italy, Switzerland, and Portugal have stated that they see the path to the future in cooperation with the Chinese Silk Road. At the same time, a parallel banking system has developed, the Asian Infrastructure Investment Bank (AIIB). Seventy countries immediately joined as founding members, although the United States put enormous pressure on them not to do so, among them such close allies as Great Britain, Germany, France, Japan, Australia, and Canada. Simultaneously the New Development Bank (NDB) of the BRICS emerged and is now operational, along with the Silk Road Fund, the Maritime Silk Road Fund, the Bank of the Shanghai Cooperation Organization, and also the Contingent Reserve Arrangement to protect countries from speculative attacks. To all the cities and regions that are cooperating with these projects, it is perfectly clear that it is to their advantage. For example, Duisburg—which was once a steel city but has experienced a great economic slow-down—is now in an upswing, because it is profiting enormously from being the largest inland port on the Silk Road. China has made Europe an offer to fully cooperate in the industrialization of Africa. And what should prevent us from doing this, along with using this Asian dynamic to develop the Balkans and Southern Europe, which has suffered economic hardship from the Troika’s policy? For example, Greece’s industry, through the Troika’s policy, has shrunk by a third. Everything can be built up again through China and the Silk Road. At the same time, the Middle East must urgently be reconstructed, and naturally, Africa. What should prevent us from taking up these offers? The answer is clear: that some countries—the United States and Great Britain—insist on a unipolar world, although this unipolar world has long since ceased to exist. The danger is that the trans-Atlantic world will fall into the “Thucydides trap”—that it will see the rise of Asia as a geopolitical threat instead of recognizing the opportunity for everyone to participate in win-win cooperation. The propaganda against the New Silk Road is gigantic. On September 12 the Said Business School of Oxford University published a report asserting that China’s huge investments in infrastructure—the equivalent of $10.8 trillion over the last decade—is leading to an imminent economic collapse of both China and the world. This is obviously a desperate attempt to slander the Silk Road, and the argumentation is that of the typical investment banker—that investments in infrastructure don’t yield enough profit. Chinese officials have already countered this argument, saying that China has a different appraisal of risk than the western rating agencies, and that it sees the potential of a country in its future, while the bankers view the past. In the history of industrialization of every country, with no exception—whether it be Germany, the United States, Russia, or any other country—the development of infrastructure was always the sine qua non for its transformation into a modern economy. The idea that one realizes a profit on infrastructural investments directly, as, for example, by tolls on private highways, is obviously absurd. The profit is in the rise of productivity in the whole nation, and the higher the level of development, the denser the infrastructure network must be. If you then include all forms of infrastructure—energy, water, communications, education, healthcare—then it is totally clear: The higher the density of infrastructure, the higher the productivity, the living standard of the population, and life expectancy. And the more advanced industry is, all the more relevant is the time factor; thus we absolutely believe that the Transrapid technology remains a technology of the future, and we will hear a lecture on this subject today after lunch. The Oxford University researchers then let the cat out of the bag as to why they published such a laughable report: They said specifically that the Chinese model should no means become the model for other developing countries, certainly not for Pakistan, Nigeria, or Brazil. That China should not be a model. But all predictions that China will collapse economically are totally absurd; look at the just published figures on annual growth. The Gross National Product is up 6.7%, exactly as predicted; industrial production is up 6.1%—what European country would not rejoice over a 6.1% annual increase? The rise in consumption is 10%. Electricity use is up 4.8%, thanks in no small part to the ongoing electrification of China’s western regions. The stance of these investment bankers against infrastructure is one of the reasons why we in Germany have an infrastructure investment deficit of somewhere around 2 trillion euro—ramshackle bridges, bad roads, and the rest. That is also the reason why the IMF conditionalities of the last 50 years have prevented the infrastructural development of the Third World, and why we today have such a great stream of refugees out of Africa into Europe. There is another false argument, namely that China actually only wants to replace Anglo-American imperialism with Chinese imperialism. I think this is the projection of people who simply cannot imagine that any country today has a positive model for the organization of relationships on this Earth. In that regard, you must understand that China not only has a 2,500-year-old Confucian tradition, but that there is at present a powerful Renaissance of Confucian thought in China on all levels of society. Part of that thought is, for example, the idea of life-long self-improvement, self-perfection, the idea that each person should become a junzi, someone morally self-possessed. To that tradition also belongs the idea of the harmonious development of all nations, and the win-win idea of Xi Jinping conforms precisely to that. It also corresponds—if we in Europe go back in our history—to the ideas of Nicholas of Cusa, who said in the Fifteenth Century that there can only be harmony in the macrocosm if all the microcosms develop harmoniously and to their mutual advantage. 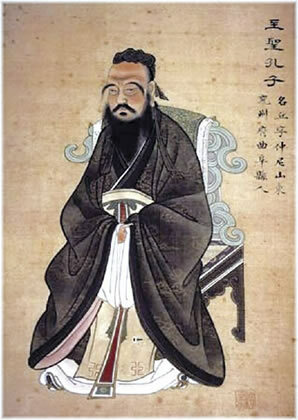 There is a deeper affinity between Confucianism and European humanism than most people realize. The problem isn’t China. The problem is that we in Europe have forgotten this tradition, or have shunted it aside—the ideal of humanity that was associated with the Italian Renaissance, the Ecole Polytechnique in France, or the German Classical period. Who today still has the optimistic image of man of Wilhelm von Humboldt, who said that the goal of education should be to create a beautiful character? Who still has the ideas of Friedrich Schiller, who said, Every man has the potential to become a beautiful soul, for whom passion and duty, freedom and necessity, are the same? The only person who can do so is the genius; but Schiller meant that all people have the potential for genius. That means that we have distanced ourselves from these humanistic ideals, or that they have meaning for only a very small part of the German population. And looking at our youth culture, no one can doubt that it is dominated by a very far-reaching degree of brutalization; ugliness is everywhere, violence is glorified, teachers are afraid of their students. The German Industrial Association wrote several years ago that 25% of 15-year-olds are not employable because they are not interested in anything. This is the first time in the history of Europe and America that we have apparently accept the idea that the next generation will be worse off than we are. For youth this means that they have no future, no reason to study and to learn. And it is totally different in China. China’s youth have experienced the Chinese economic miracle, and most of them—not all, of course, but most—have an enormously optimistic conception of themselves and their country. That means that also in this respect, Europe and Germany could cooperate with the Silk Road so that our youth can regain a perspective. Germany is the most important economy in Europe. I think that if we can get Germany to consciously say “yes,” officially, to cooperation with the New Silk Road, that would perhaps be the most decisive step which Germany could take for the preservation of world peace. The issue is a totally new paradigm, a totally new era in the history of mankind. The issue is the idea that mankind as a whole represents a higher order than all of the nations. If we focus on the common aims of mankind, what Xi Jinping calls the “community of destiny” or the “community of the common future of mankind,” then, I think, everything is possible. What are these common aims? 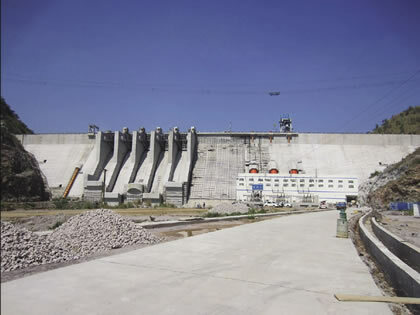 Bui Dam in Ghana, built and financed in large part by China, 2009-2013. Europe, Japan and India, already engaged in Africa, should cooperate with China in the common aim of mankind to industrialize Africa. The industrialization of Africa, for example. If Germany and Europe were to cooperate with China, with Japan and India—all of whom are already engaged in Africa—we could create a situation in which tens of thousands of people are no longer either dying of thirst in the desert or drowning in the Mediterranean, while fleeing from war and starvation. We could build up the Near and Middle East again, which is our moral responsibility, because we have tolerated these wars which everyone knows were built on lies. We could give all children access to education and thus set free the real creative potential of mankind. We must concentrate on a new scientific revolution—the principle of life, the creative potential of the human spirit as a physical force in the universe. We must better understand the processes of the Solar system, of the Galaxy, of the Universe as a whole. We must put ourselves in the position of astronauts, cosmonauts, and taikonauts, who all report that when you look down on the Earth from space, it is only a small blue planet, which has no limits, but is also infinitely vulnerable. The first law: Under the natural law of this universe, nothing and no one imposes any limitations on man, but he himself. Second: The rightful field of action for mankind is not only the Earth, but the whole Solar system, and as much of the Universe as he can reach under natural law. China’s youth have experienced the Chinese economic miracle, and most have an enormously optimistic conception of themselves and their country. 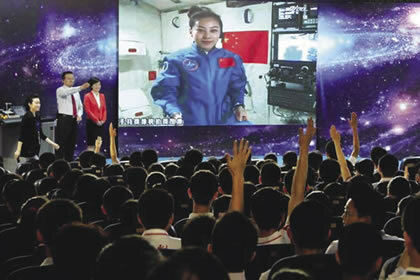 Chinese astronaut Wang Yaping teaching a class in Space physics live from orbit to 60 million students, including these Beijing high school students, during a June 2013 Space mission. And third: When he expands into the Universe, man fulfills his destiny as an element of life, endowed with the power of reason and the wisdom of the moral law within himself. The infrastructural development of the New Silk Road therefore means not only the improvement of the landlocked regions of the Earth, but also the improvement of the nearby space environment. The Chinese lunar program, with Chang’e 4 and 5, plans to land space vehicles on the far side of the Moon in two years, with the purpose of later mining Helium 3 for a future fusion economy on Earth, which will finally bring mankind energy and raw material security. Just now there was a successful docking of the space vehicle Shenzhou-11 with the Tiangong Space Station, where two Chinese taikonauts will carry out experiments for 30 days. China will have a permanent space station in a few years—as early as 2020 or 2022. Thus cooperation in space is one of the most important areas of the common aims of mankind, because it challenges man practically on all fronts of his physical and spiritual existence, and it reflects to the highest degree the independence of the human spirit and absolutely touches the philosophy of his existence. I think that we can survive the challenges with which we are currently confronted on Earth with this orientation to the future, and on the level of reason. But I think we can do it. 1. EM is one of France’s largest schools for management.